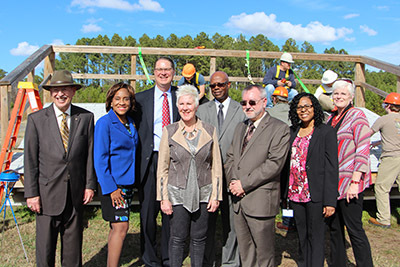 Above: Tidewater Community College and Dominion Virginia Power celebrate their commitment to solar power and community college’s role in preparing the workforce. Shown here are Jim Eck, vice president of business development with Dominion; Lisa Rhine, provost of Chesapeake Campus; Edna Baehre-Kolovani, president of TCC; Thomas Stout, dean of science, technology, engineering and math; student Harrold Craddock; and Max Bartholomew, regional policy director with Dominion. A bright, sunny day beckoned guests to Tidewater Community College’s outdoor solar laboratory for a celebration and conversation about renewable energies. TCC and Dominion Virginia Power representatives gathered with community members to talk about their commitment to solar power education and community college’s role in preparing the workforce. laboratory on TCC’s Chesapeake Campus. TCC is one of seven community colleges in Virginia providing technical training and know-how for students pursuing work in the emerging solar, wind and geothermal industries. 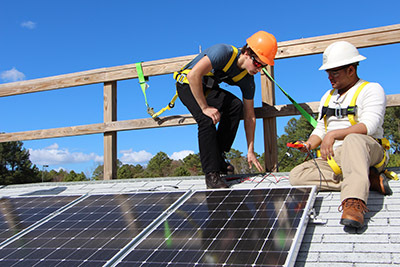 Dominion Foundation, the philanthropic arm of Dominion Virginia Power, has invested in solar training education by providing a grant of $150,000 to Virginia’s Community Colleges to advance program offerings. TCC has been a front runner in renewable energies training, establishing one of the first Career Studies Certificate in Renewable Energy Technologies. In addition, the college offers the Solar Ready Vets program, which prepares transitioning sailors for work in the solar industry. The Dominion Foundation began supporting these programs with a grant in 2010. The funding enabled the college to build and install the solar technology on top of the George B. Pass Building on the Chesapeake Campus. Subsequent grants in 2013 and 2016 have helped build the curriculum for alternative energy education. The Solar Foundation recently reported that 1 in every 50 new jobs in the U.S. in 2016 was affiliated with the solar industry. “Having well-trained solar workers is critical to companies like Dominion as we venture into new ways of generating electricity for the Commonwealth’s 2.5 million electric customers,” said Jim Eck, vice president of business development at Dominion Virginia Power.